The Norman Regional Health Foundation commissioned a public art piece to serve as an iconic entry point for the new Norman Regional Moore health care facility which opened in June 2016. 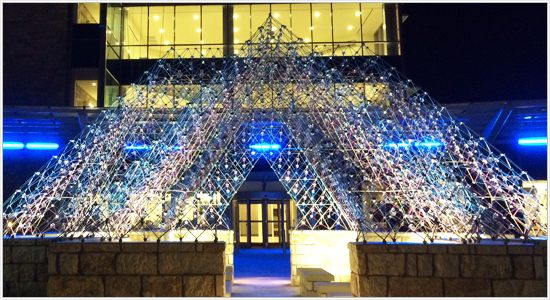 Sanctuary was created, designed and installed by Brower Hatcher and the Mid-Ocean Studio team from Providence, RI. Sanctuary was designed as a healing chamber in a three dimensional configuration of the Norman Regional Health System logo with connecting steel rods representing physicians, patients, staff and community. With more than 2,000 crystal connectors, Sanctuary's prismatic light will have the effect of inducing feelings of hope and healing for the Moore community. Thank you to the Sanctuary contributors for investing in this visible symbol of hope and healing.